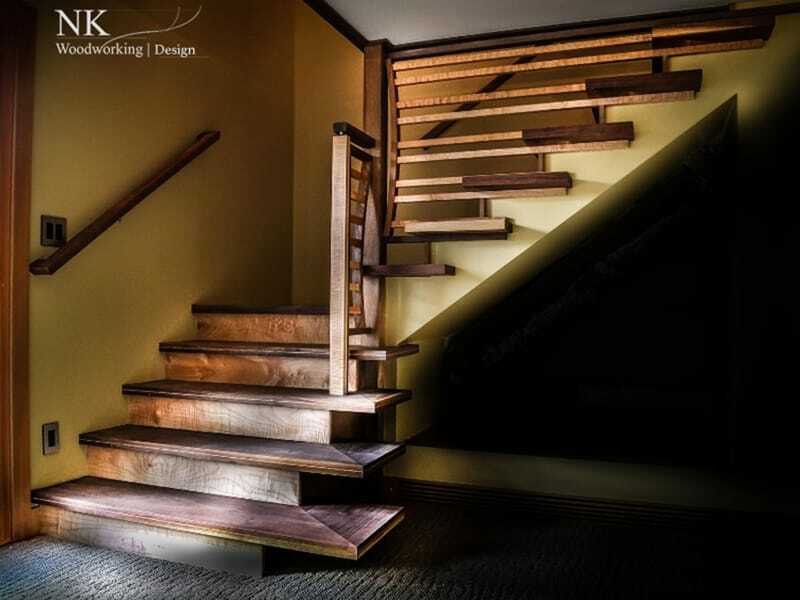 Seattle’s NK Woodworking and Design is currently building a staircase that incorporates a variety of fine wood, a high degree of precision engineering and craftsmanship, and 4,000 completely unique hand-shaped wood pieces, each of which took the equivalent of a day’s work to make. 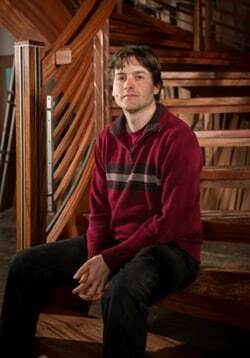 "I would argue and most would agree that it’s probably the most complicated wood staircase ever made," said Nathie Katzoff, right, the company’s 29-year-old founder. The staircase project is not that unusual for Katzoff and his staff of 20, nor are their regular sweeps of national industry awards. It’s all part of a building reputation for one-of-a-kind functional art, from the grand custom staircases, to inlaid ceilings and floors, to fine furniture such as tables, unique cabinetry and wooden bathtubs. "When I was starting NK I built a set of stairs for a friend who was constructing an eco-housing development," he recalled. "I basically just had a material budget but really went all out on craftsmanship." 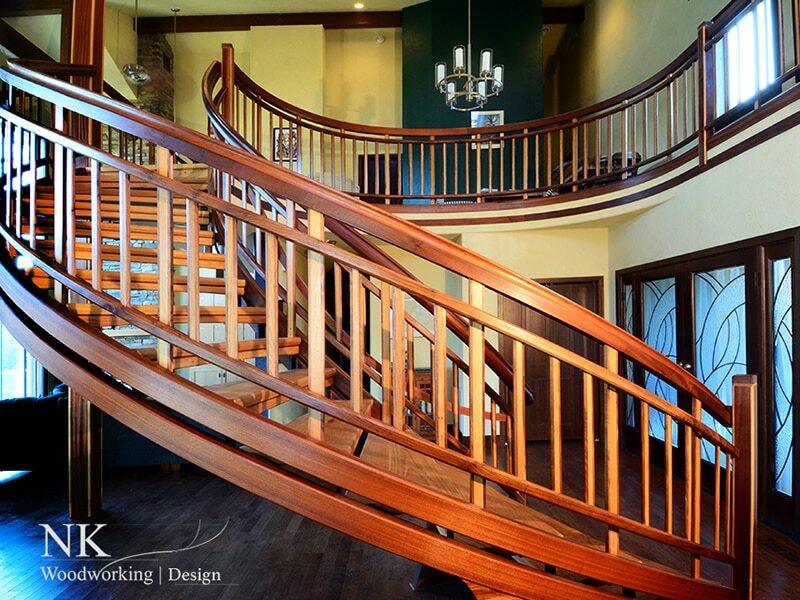 That staircase was very large, made entirely of interlocking pieces connected with dovetail and mortise and tenon joinery, and ended up winning an award from the Stairway Manufacturing and Building Association, which is the national organization of the leading stair builders in North America. "That sort of launched the stair obsession and we started getting inquiries from people from all over," he said. 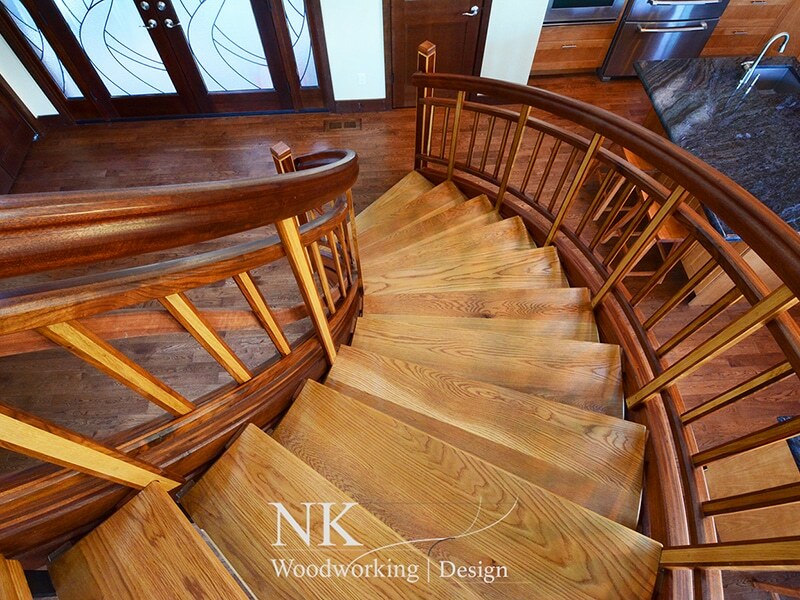 NK has earned more awards in a three-year span than any other company in history, beginning in 2014 with four out of five of the Association’s Best Staircase awards. 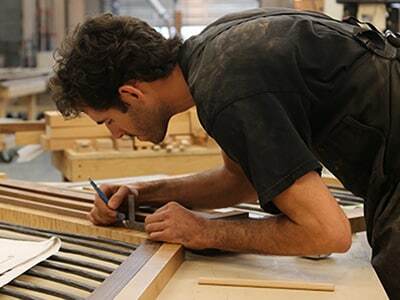 Over the past six years, Katzoff has brought together artisans and craftspeople who are experts in carving, boat-building and fine furniture making. He employs two design engineers with strong backgrounds in furniture and stair design, along with accounting and marketing staff. Phoebe Schraer, the company’s Field Marketing Director, finds increasing interest in staircase design and construction. "When I meet with architects and contractors," she said, "I often focus the presentation on staircases and the importance of the entryway. In the past everything was artisan. You look at homes on the East Coast from the 1600s-1800s and everything is traditional craftsmanship that looks exceptionally beautiful to us. 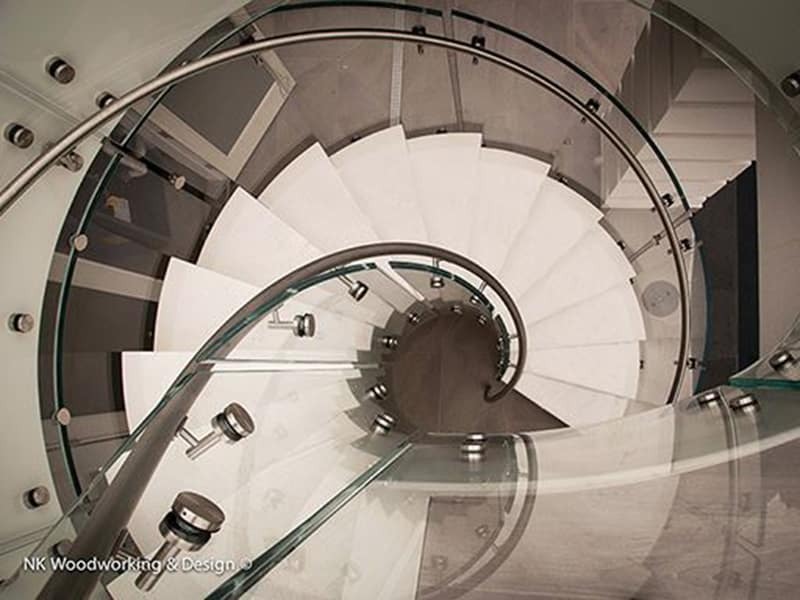 Now that same stair is a very high-end specialty piece." "Our work seems to come from architects, interior designers, builders, art collectors, and homeowners who have found us," Katzoff added. "It’s a combination of all people who are interested in either art or craft." Occasionally clients will come in with a photograph of something they want replicated, or ask for the same piece another client had built. As Katzoff explained, that’s not what NK Woodworking does. "We’re always trying to apply something a little more innovative or brilliant to a project," he said. “We try to take inspiration either from the people who are buying it, or from the space where it’s going. We approach it more holistically, looking at how the piece is going to affect the space and the overall experience of it." Though he worked with wood as an adolescent, it was after high school that his mastery over the material began to emerge. "When I was young I probably made all sorts of garbage and I don’t know if I’d count any of that," he laughed. "Then when I was 16 I worked as a carpenter helper doing basic remodeling stuff and I did one or two basic stairs then. But the first pieces that I got involved with that had any sort of merit were when I trained as a traditional shipwright in Maine and we worked on a number of classic yachts by Herreshoff and others. Those were the first pieces that I really took pride in." Although "it’s been a little while since we’ve done any boat stuff," Katzoff’s early training in marine design continues to inform his work. "The structural work is probably the most valuable experience, because it’s dealing with a lot of compounding curves," he explained. "The biggest claims to fame that we’ve had were both boat-inspired. First, the large curved and twisted staircases that are both beautiful and structurally sound, and now the bathtubs, which are sort of the reverse of a boat." 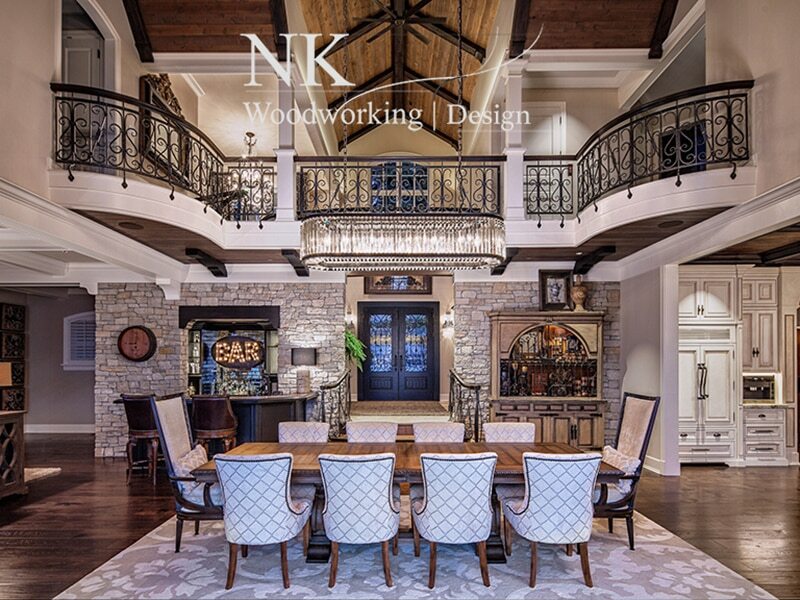 NK Woodworking is now creating work on par with the priceless pieces we see thrilling furniture experts on PBS’ Antique Roadshow and other popular programs. "I recently gave a talk at Virginia Tech based on the idea of the revival of those earlier techniques,” Katzoff said. "Since the 1950s there’s been this shift to cheaper, cheaper, crappier, crappier. But my approach has been in the opposite direction. I’m someone who is a freak when it comes to appreciating traditional skills ranging from the forage work to traditional woodwork. But I find it really embarrassing that people can look at an 18th Century piece of furniture and say ‘Wow, how did they do that?’ We now have design software to draw with and power tools to cut just about anything into any shape. The possibilities today are mind blowing. "It’s just a matter of making that cultural shift to where people really value this level of quality work," he continued. "We have an opportunity to make pieces that make the 18th Century work look like history instead of something better than we’re capable of. I think in that regard NK is a rare bird." 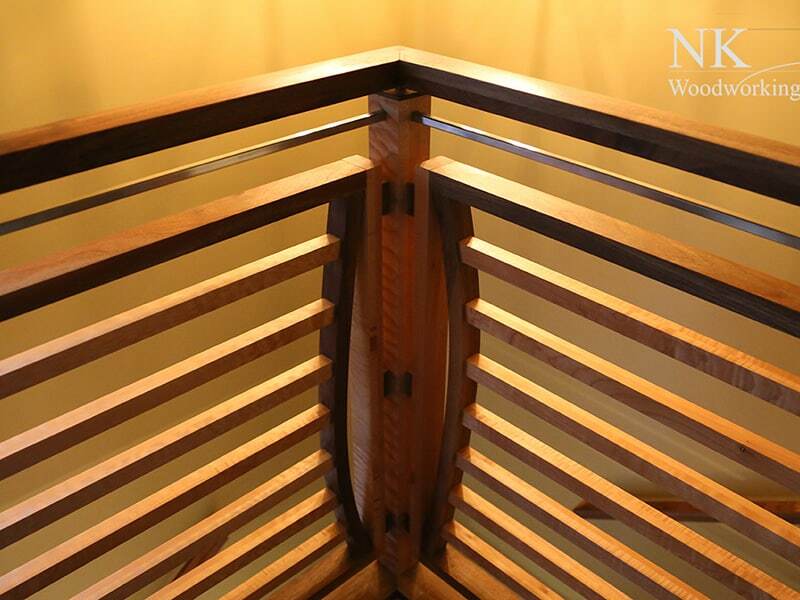 Though Katzoff and NK Woodworking are still young, they are providing builders and homeowners with functional art that will survive many lifetimes. "All our creations are really masterpieces with the ability to last – as long as the people who own them view them that way and continue to keep them maintained,” he said. “I’m pretty optimistic that they’re all going to outlive my lifetime and depending on how the world progresses over the next century, there’s every reason to believe they will be around for hundreds and hundreds of years." 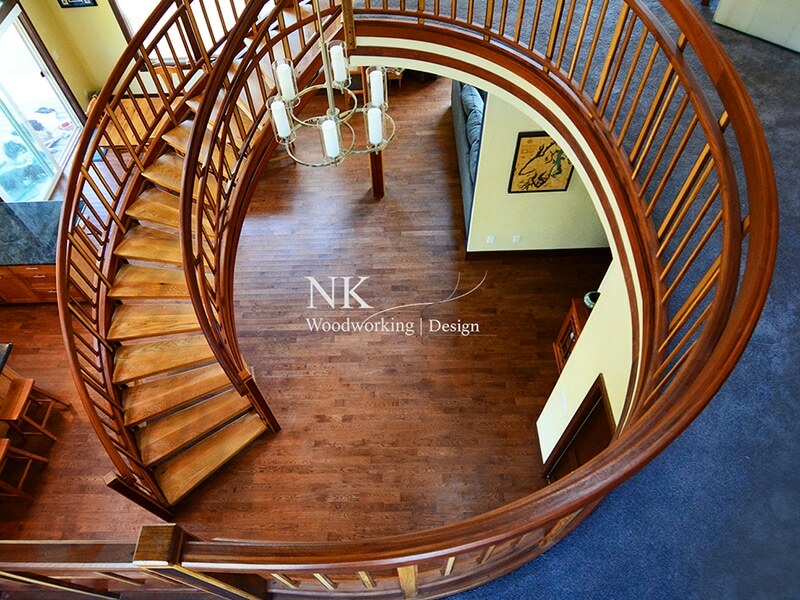 More information: To learn more about NK Woodworking and contact company, visit its website, its Facebook page, or its pages on Houzz.com. Photos (from top): A Harmony Curved staircase composed of walnut, sapele, and white oak that won Best Curved Rail Design in the 2015; Nathie Katzoff; Kalib Hone working on constructing a balustrade of forged steel, figured maple and Sapele, and a Classical Stair design in black walnut and hand forged blackened steel. The Harmony Stair Design utilizes floating curved stairs with split stringer detail. A side view of the Harmony Stair Design, an original technical concept by Nathie Katzoff. The Harmony Stair Design, shown from above, uses materials including white oak, black walnut and sapele. The Demascus Stair Design, a blend of hand-picked, figured maple and black walnut with chrome details. 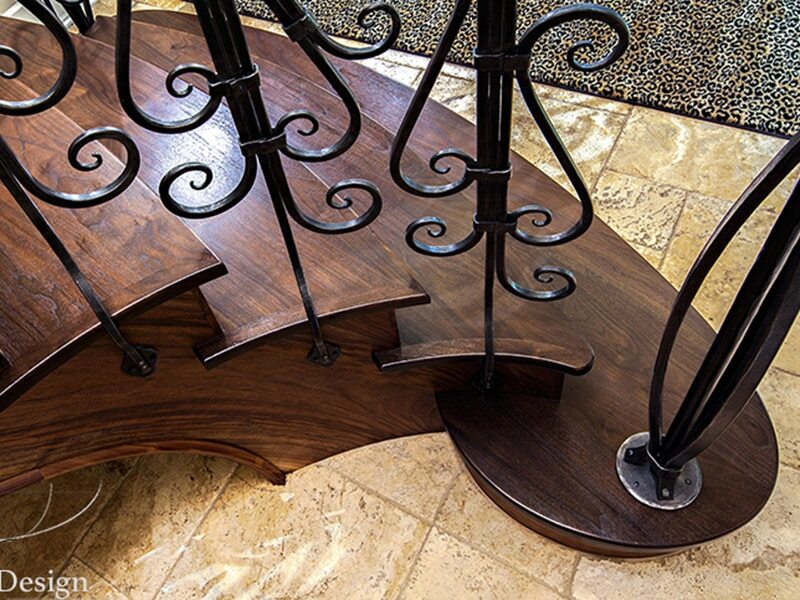 A close-up of the Demascus Stair Design, made of figured maple and black walnut with chrome details. 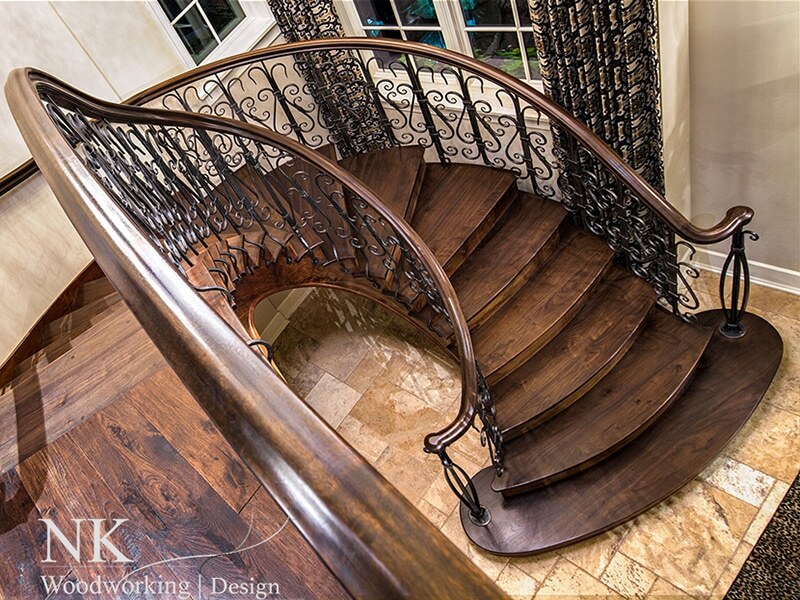 NK Woodworking custom-designed this Classical Staircase in black walnut and hand-forged blackened steel. View of the upstairs rail system and catwalk, with forged steel and walnut balustrade, in the home where the Classical Staircase is installed. 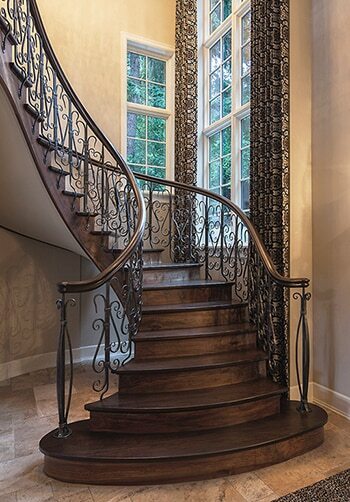 A closer view of the Classical Staircase's black walnut steps and and the hand-forged blackened steel railing. 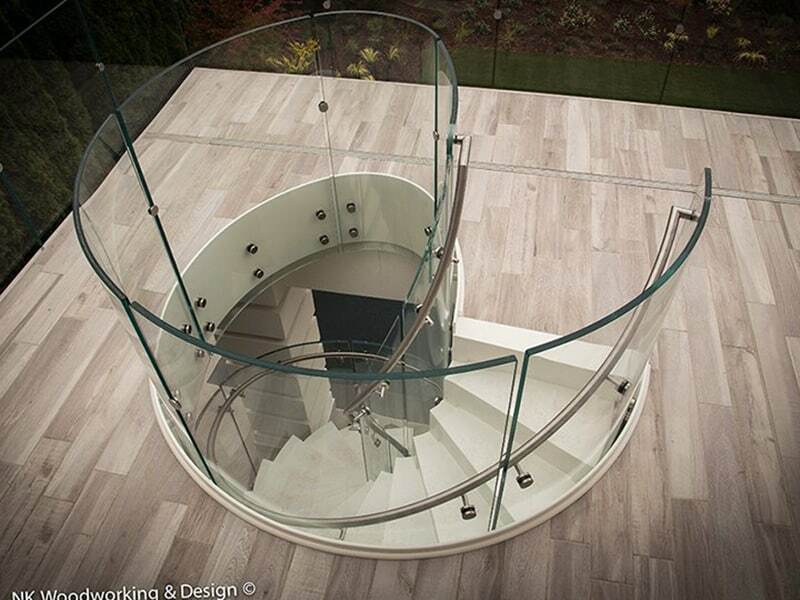 Exterior spiral stair design with curved glass and brushed stainless balustrade. 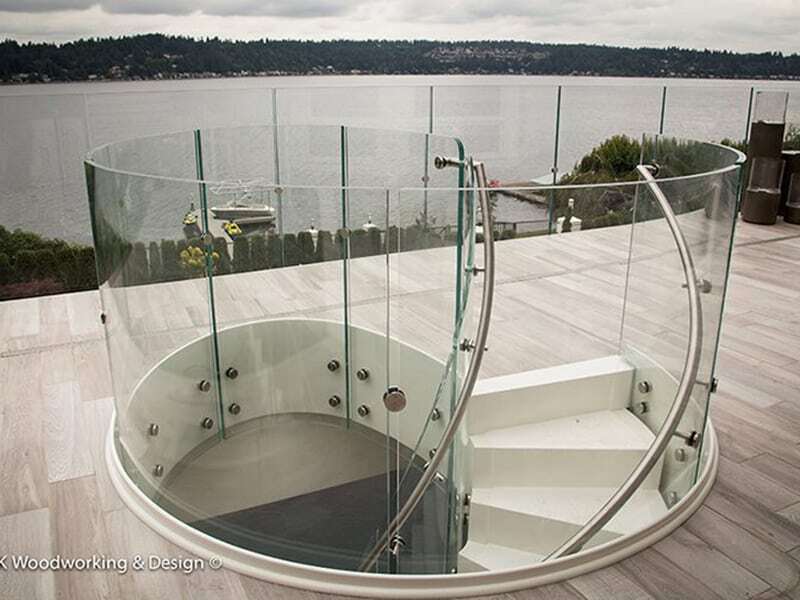 Another look at the stairway that uses a fiberglass design in response to the exposure to Northwest weather conditions. 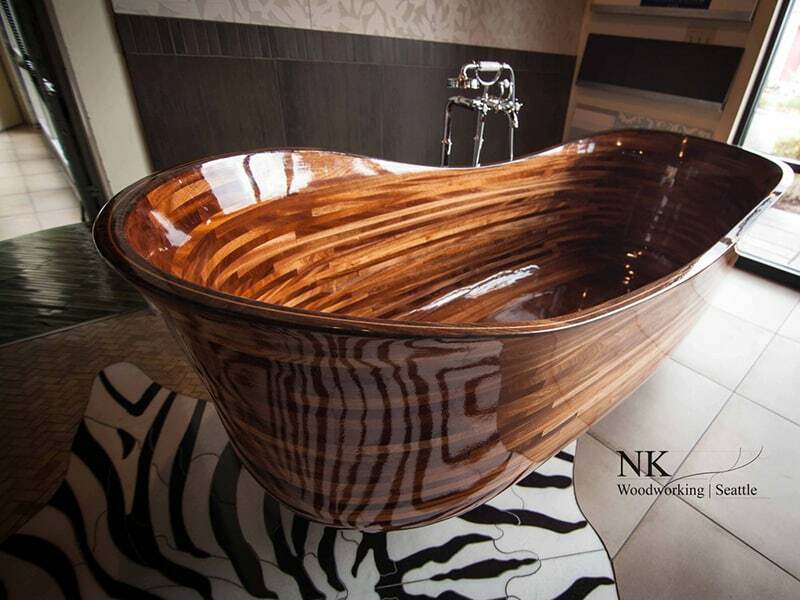 The NK Woodworking fiberglass design utilizes NK Woodworking’s boat building expertise. 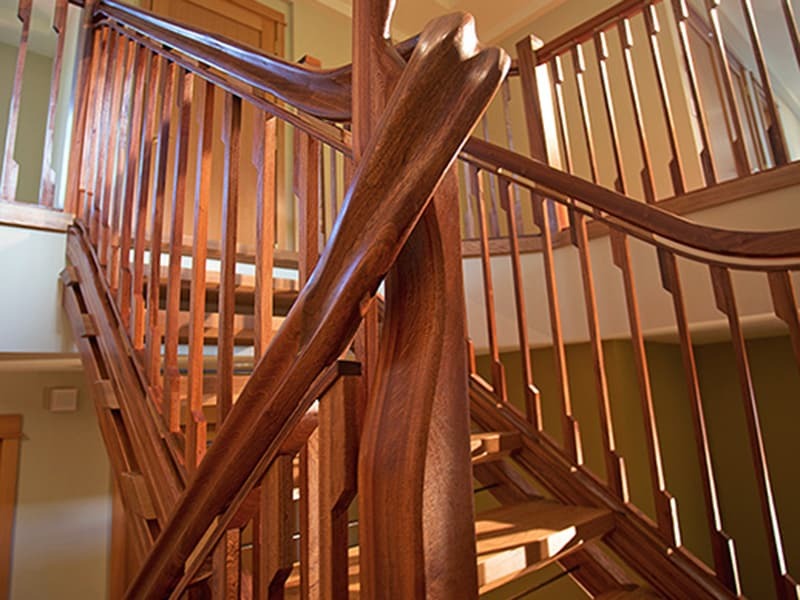 Example of a hand-carved tangent handrail. 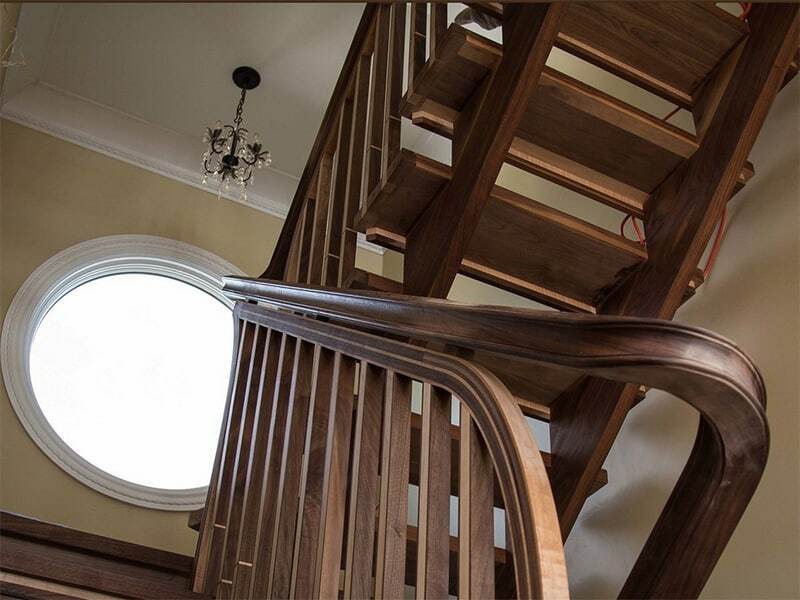 This stair combines maple and walnut, integrating numerous joinery and fabrication techniques. Not shown is an inlaid compass rose at the landing. 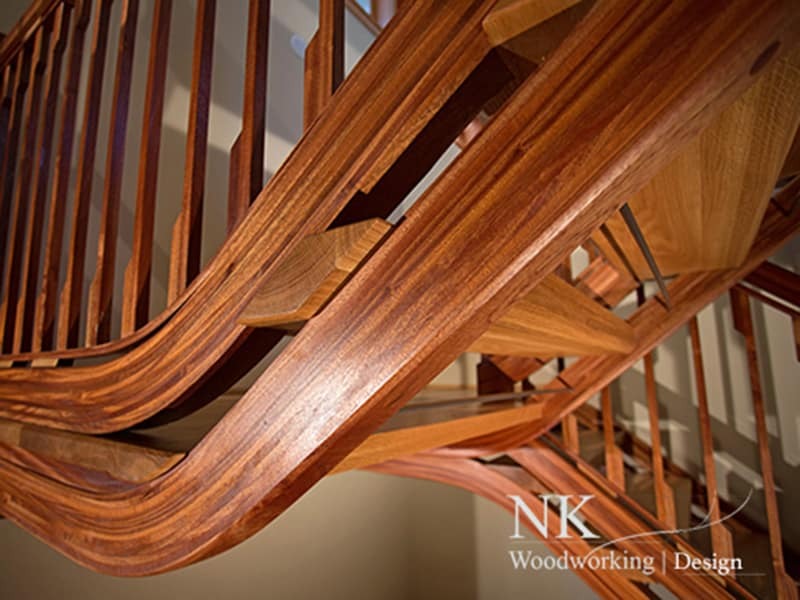 A custom sculpted rail design with NK Woodworking’s split stringer system in cherry hardwood. A close-up of this split stringer system in cherry hardwood, which won an award for technical inventiveness and design aesthetic. Slideshows: Above, various staircase designs, and below, a ceiling, floor, railing, table and various wooden tubs. 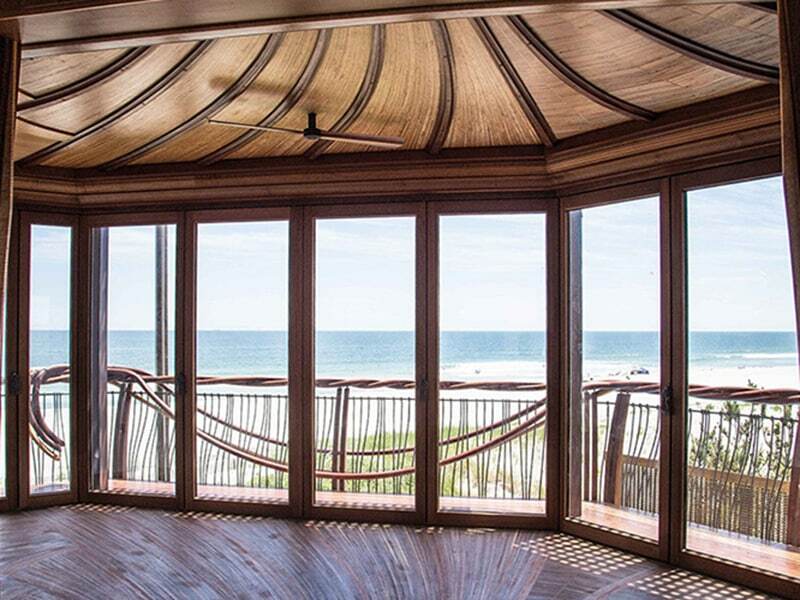 Ceiling and floor mirror each other with a seashell design in this custom room and exterior rail design. Ceiling and floor are maple and sapele. 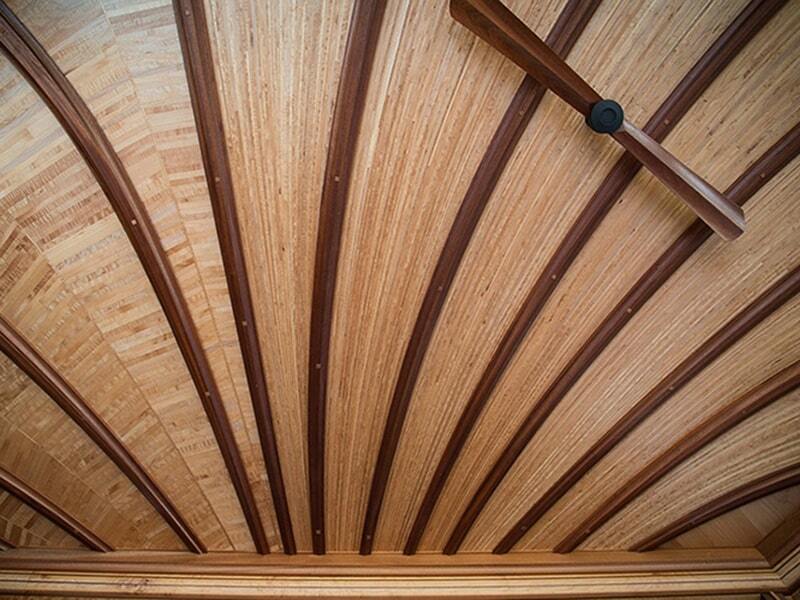 A close-up of the ceiling, maple with sapele spines that line up with the sapele window frames. 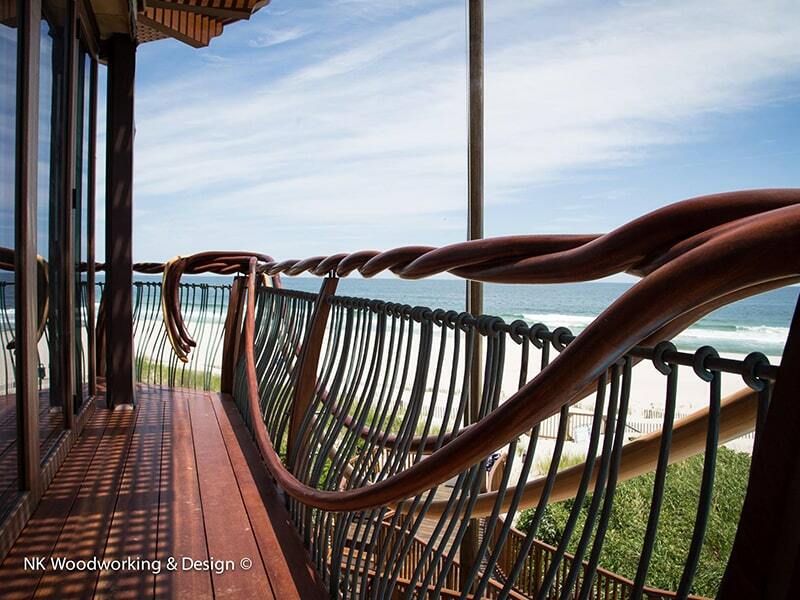 The railing is hand-carved Sapele and Alaskan yellow cedar with forged bronze balusters. 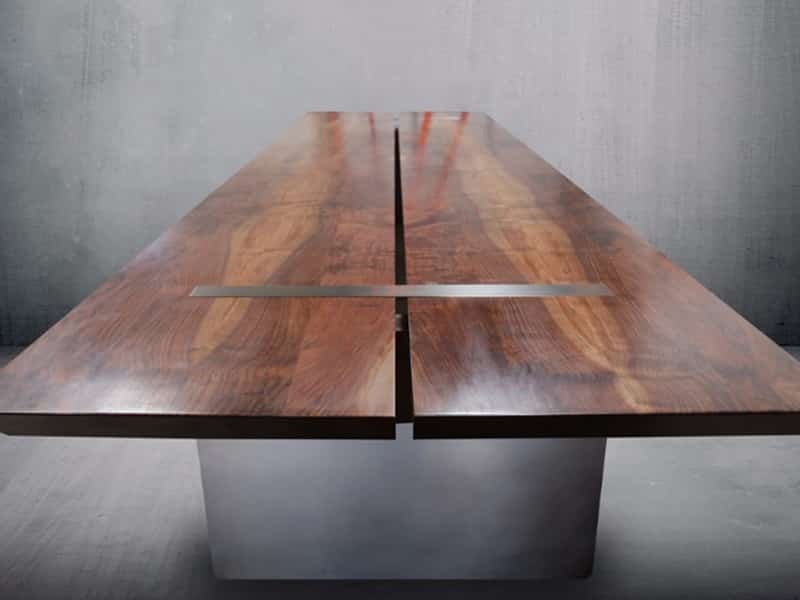 This walnut and brushed nickel modern design dining room table is an example of a collaboration with a local interior designer. A walnut bathtub with customized air jet system installed in a marble surround. 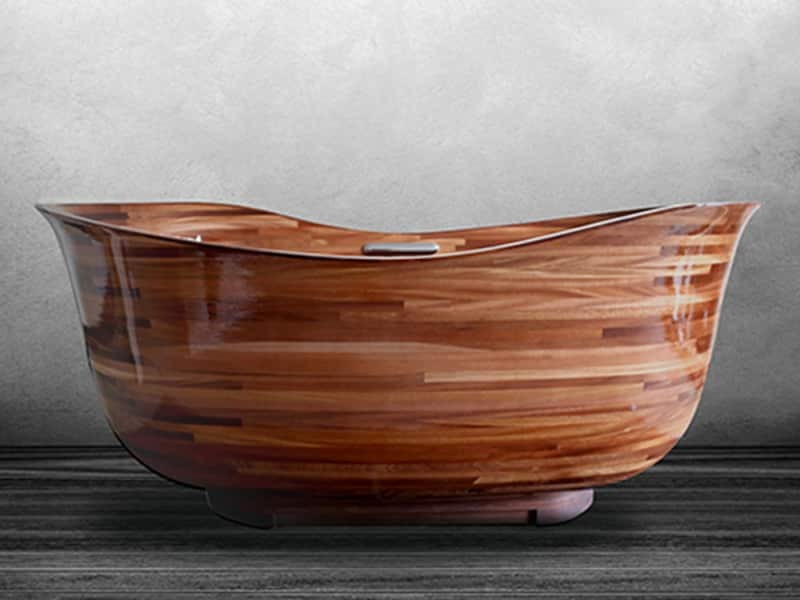 Petite Lotus bathtub design in Sapele. 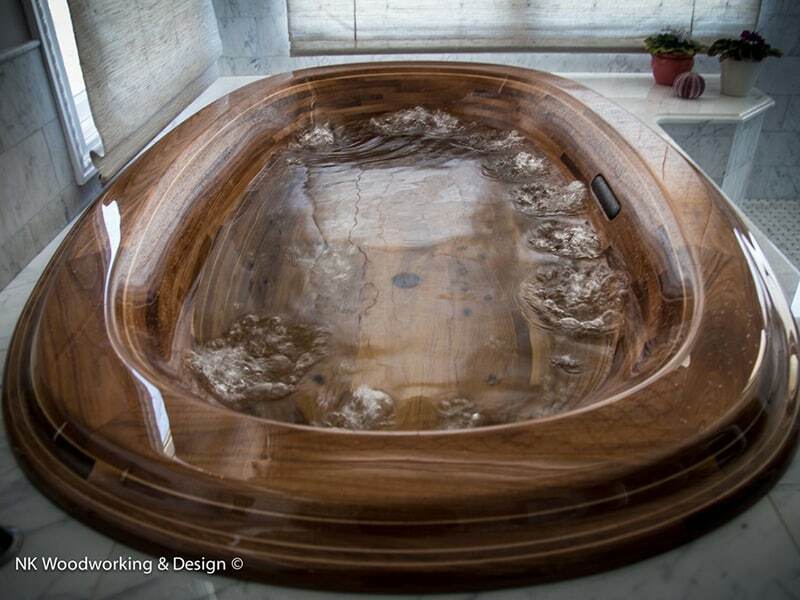 An original Lotus Design Bathtub, in sapele with walnut cap detail. Each tub is one-of-a-kind, with its size and shape modified to individual specifications. The bathtub pictured above is 84" long. 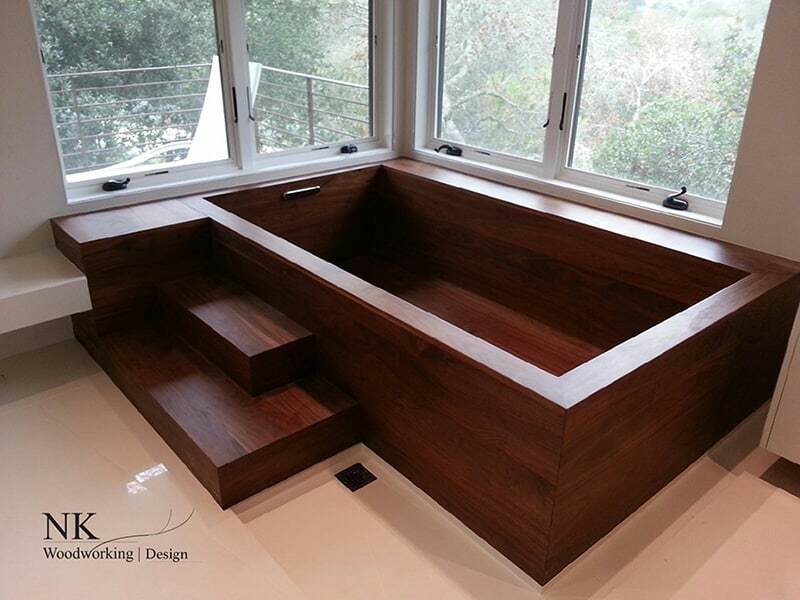 A Japanese soaking tub in walnut with a customized water heating and circulation system.